With the 2005 Christmas Key we are revisiting the original-- a tiny key equally at home in the radio shack or decorating a Christmas tree. 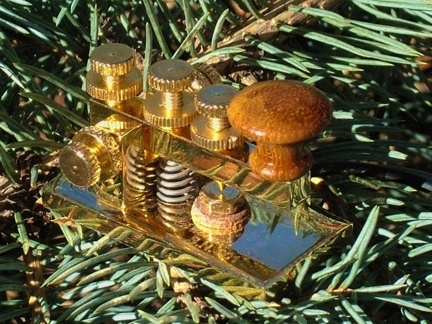 The Morse Express Christmas Key is a fully operational miniature key, hand machined from solid brass, under-plated with nickel and finished in 18 carat gold. It measures 2" by 1" at the base and weighs 3-1/4 ounces. All of the usual adjustments (trunnion bearing tension, lever spring tension, and contact spacing) are available by means of gold plated screws with matching locknuts, and the sculpted knob is very comfortable to use. The pre-attached shielded cable has a molded 1/8" mono plug. The Morse Express 2005 Christmas Key is $69.95 (plus s/h). 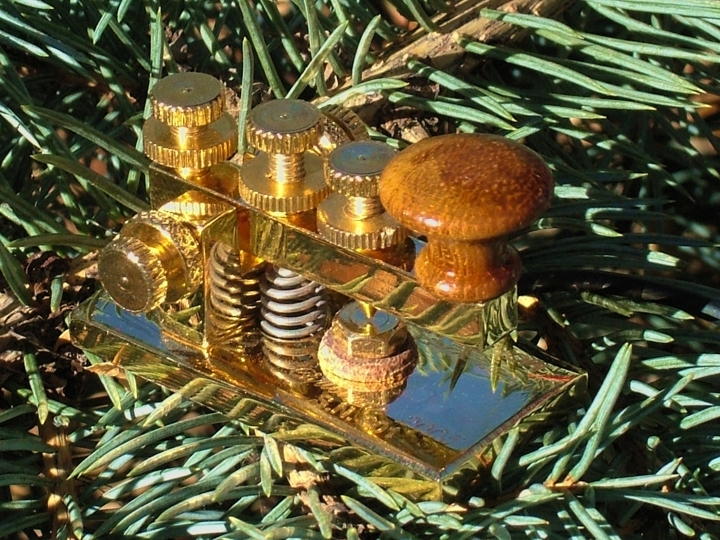 * For those interested in the details, the polished brass parts are first plated in nickel, then 18 Karat gold.